The Matrix wood stove uses the same engine as the proven Osburn 2000. However, its clean and modern look is sure to bring a European touch to your room. The top of the stove is made of cast iron with two rich pieces of soapstone, which remind us of the renowned Finnish fireplaces. Optional soapstone side shields are also available. 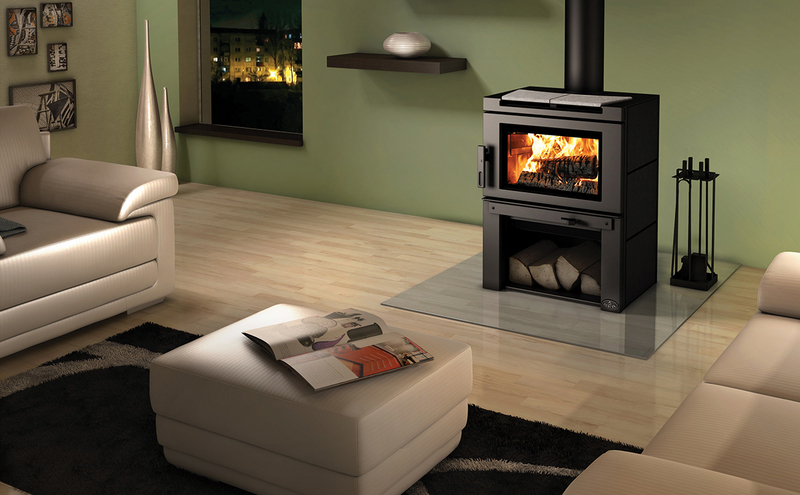 Logs can be conveniently placed underneath the large firebox, making the Matrix a practical and elegant heating machine. 100% of the last 24 homeowners who have registered their warranty are satisfied with this product. Clearance – back wall 15" 6" 15" 6"
Clearance – placed in a corner 10" 6" 10" 6"
Clearance – side wall 16" 14" 16" 14"
Clearance – top (measured from the platform on which the appliance is installed)** 72" 72" 72" 72"